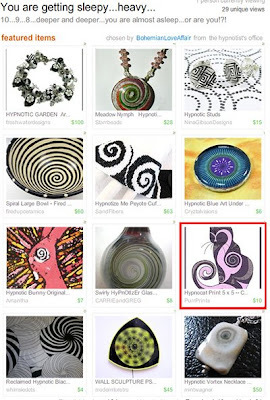 I just discovered that "Hypnocat" was picked for a fun and lovely treasury themed around hypnotic swirls. Check out the pretties (clicking the image will take you to the treasury itself, where you can see the items in larger pictures--the pendant on the lower right is especially pretty up close). Shortly after I was brought home, I noticed my parents using this strange word around me...and they used it all the time: woot. They'd call me a woot-hog, the woot usurper, woot desperado, and so on. Eventually I figured out that when they said woot they meant some weird combination of affection and cuteness (one day I heard mom tell a friend that it was based on the phrase "cuteness de wootness," which was apparently used by a kindergarten teacher mom knew). Anyway, once I figured out what they meant, I got it. I mean, I'm always running around begging for affection and doing cute things to get it, like standing up on my hind legs, and rolling over onto my back, and mewling pitifully. So I was like, yeah, bring on the woot, I love me some woot! So you can imagine my confusion when I discovered that woot has a totally different meaning online, and has nothing to do with cute affection, or anything like that. I'd found this woot widget on blogger that I was trying to get Mom to add to her blog, but she showed me the site it linked to. 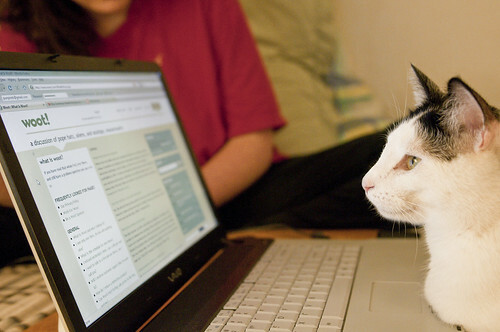 Dad snapped a picture of me reading up on woot.com--I was very disappointed to see that it apparently is a weird kind of electronics store. I was hoping I'd find some great deals on woot--not crazy computer stuff. Sigh. So now I'm terribly disappointed. If anyone wants to send me some woot in the form of psychic pats, chin skritches, belly rubs and so on please do--this woot.com thing has me all depressed. It's in the 60s here today, and even though it's cloudy, and super-windy, and doesn't look spring like at all I've decided that this time it's officially the start of Spring. Not that this is the first time it's gotten this warm here this year. Louisville is notorious for being Summer-like on Thanksgiving and getting freak cold flashes on Derby (first weekend of March, for the uninitiated). So we've already had several upper-60s warm fronts come through that turned to snow three days later. I didn't pull out my spring dresses for those. So who's with me on willing an end to winter? I know all you folks way north of here probably can't even consider it, but for now at least I've decided Spring is a state of mind. On another springy note, I should be able to get pics soon of my new screenprinted tees--Robin did an awesome job with them!